For many years, economists and law-makers believed that the free market system, where government interference is highly limited, was the best system for us. It maximized our production efficiency, it increased the wealth of the people. We established highly competitive industries, increased production to an unimaginable extent, and got used to consume more and more goods we produced by depleting the natural resources. With the undeniable climate change we are experiencing, our beliefs are now to be tested. The questions we are asking ourselves today are the externalized costs, sustainability of our consumption habits, and the effects of our global economy on the nature. Can we really continue like this, or do we need fundamental changes? Group of Twenty, an international forum made of governments and central banks of 19 countries plus the European Union, was established in 1999 to address issues regarding the global economy. 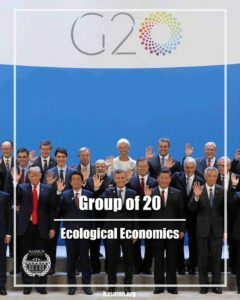 With its members accounting for around 90% of the global economic production, it is safe to say that G20’s decisions shape our world, and regarding the climate change and the ecological problems we are facing, the wellbeing of future generations will be determined by the success of G20 in making the necessary changes. With our agenda of changing the global economy in an eco-friendly way, you are welcomed to help us save our future!